With the departure of Mr. Immelt this morning we use this piece primarily to provide clients with links to the pieces that we have written this year. GE – Follow the (New) Words – Buy! Trying to Make Sense of GE: Are the Green Shoots Appearing? 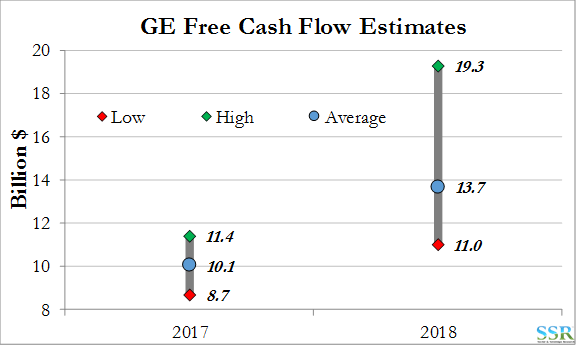 Another Reason to Look at GE – Not Participating in the Rally – Yet! “Last week, GE stepped back from targets on costs and earnings agreed with key shareholder, Trian, only 2 months after the targets were agreed – this against a backdrop of improving US and Chinese growth and a White House talking up the US economy at every opportunity. We see this as somewhat defeatist and it suggests that GE management does not have its arms around the company properly. Either the arms are too short (management is not up to it) or the company is too big. Regardless of the reason it is time for change at GE. While the company continues to miss targets its accounting is so complex that it is right to question whether they understand what they have. Cash flows do not correlate with earnings – and the regular question is whether cash flows show the underlying state of earnings or whether earnings show the underlying state of cash flows – if it is the former, there is less value in the company than we believe. Overwhelming everything is volatile cash accounting – around working capital changes and M&A that result in the range of estimates for 2018 shown in the exhibit below. With this range of estimates how can any investor understand what they have or get confident that the company understands what it is managing”. New leadership is good news in our view – but new leadership alone will not fix GE’s problems – the issues of complexity remain and Mr. Flannery is an insider – perhaps not as open to the idea of radical change as an outsider might be. Note that Mr. Immelt has played a reasonable “incremental” strategy given the hand that he was dealt; and it has not worked.